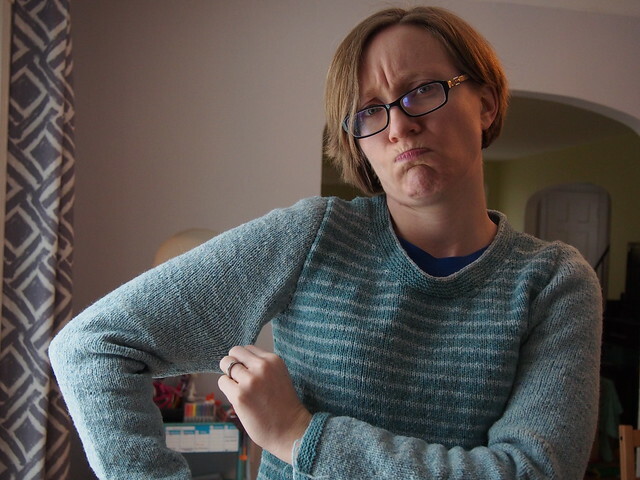 I haven’t had all that much time to knit this week, but I have at least reached elbow-length on the Sleeve That Was Ripped Out By Mistake. 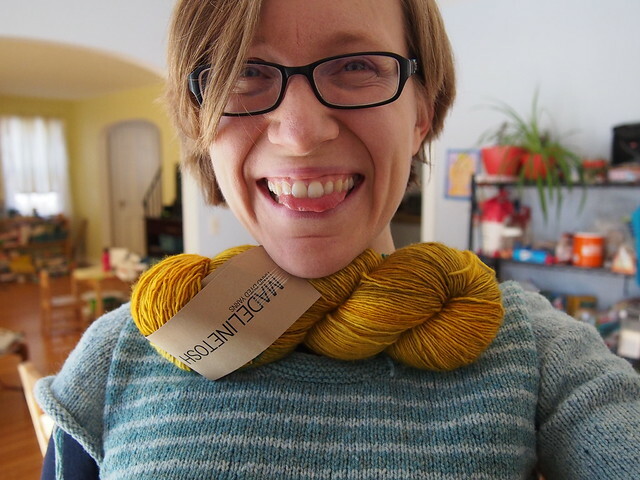 So I used a gift card I had and picked up a skein of Tosh Merino Light in “Candlewick”. 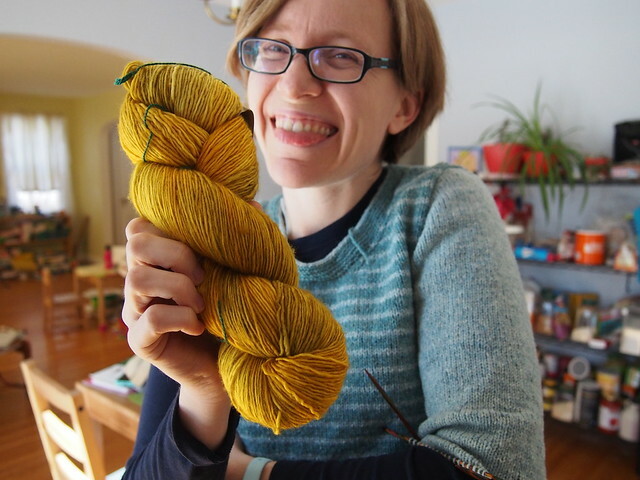 There’s a reason I don’t have anything yellow in my wardrobe, but of all the yellows out there, I kinda like the golden, slightly-greenishness of the “Candlewick” colorway. 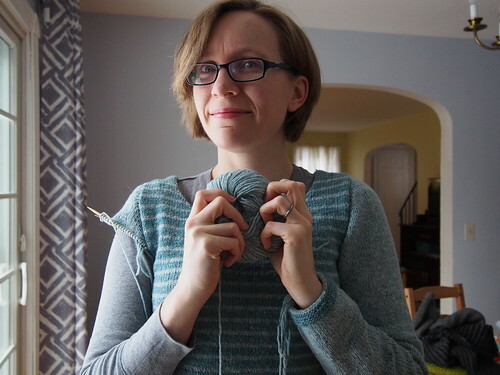 So…yeah, I’m gonna knit an entire cowl because of one concert. A totally Normal, Reasonable Thing To Do. Yes, indeed, I am a ridiculous person! 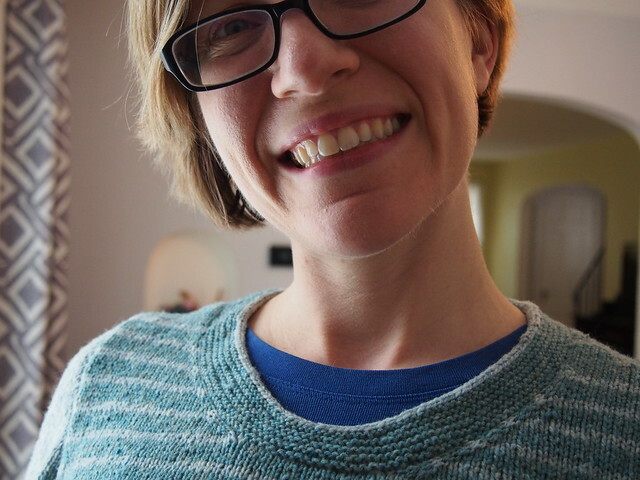 But in my defense, I do need a small, portable project to bring with me next week, when I’ll be presenting at the CCCC 2019 conference down in Pittsburgh, and I know from last year that I can knit an entire cowl while at this conference, so I think my prospects of finishing are actually pretty good! 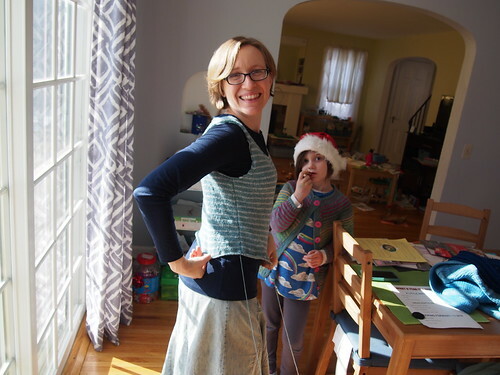 well…at least my neckband looks good? 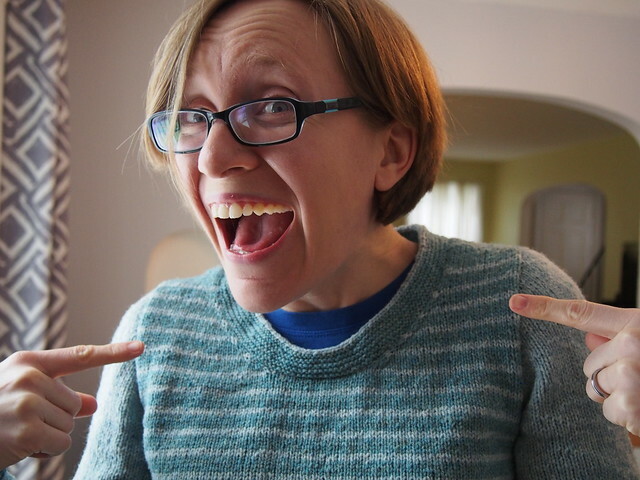 I snuck every bit of knitting time I could into my schedule last week, and I actually FINISHED my sweater! 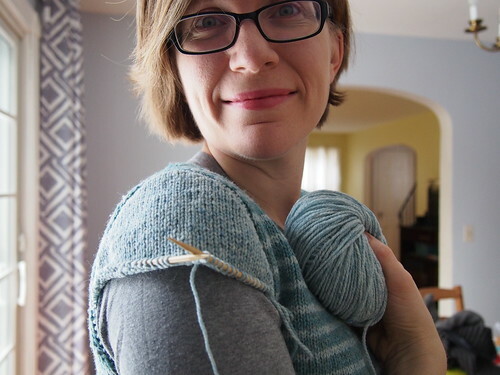 Isn’t that a nice-looking slightly short-rowed, garter stitch + contrast i-cord neckband? 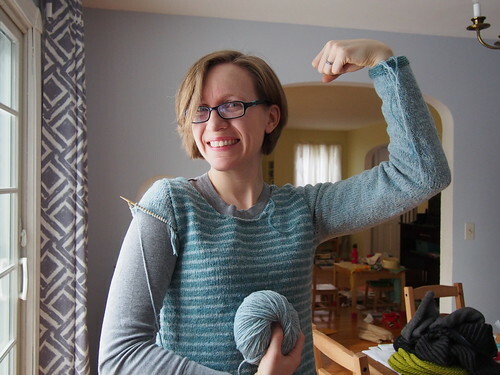 I took it off and counted my sleeve stitches, and sure enough, sleeve number two had 4 extra stitches at the underarm, and at 5.25 sts/inch, that makes a noticeable difference in sleeve circumference. 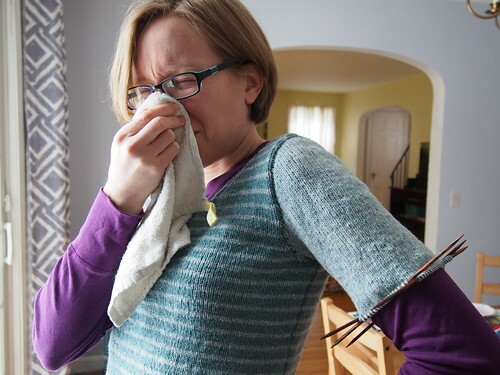 Mistake number one: Why on earth did I not count the stitches in sleeve number two BEFORE I knit the entire sleeve? 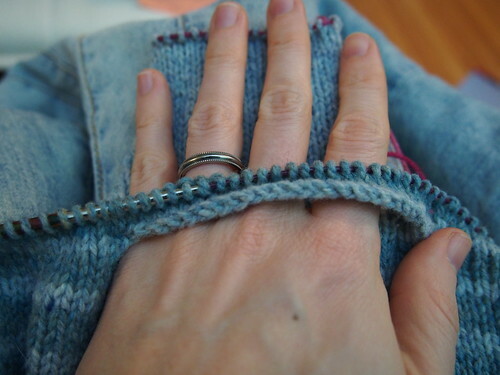 Dear self: never assume that just because you “did the same thing” when picking up stitches for the second sleeve cap, that you ACTUALLY did the same thing. Check it! But that wasn’t the end of my mistakes today. Oh, it gets worse, friends. I carefully threaded a lifeline through the top of the baggy sleeve number 2, and then went to rip it out. Except. Except. Guess which sleeve I *actually* ripped out? The one that actually fit properly. 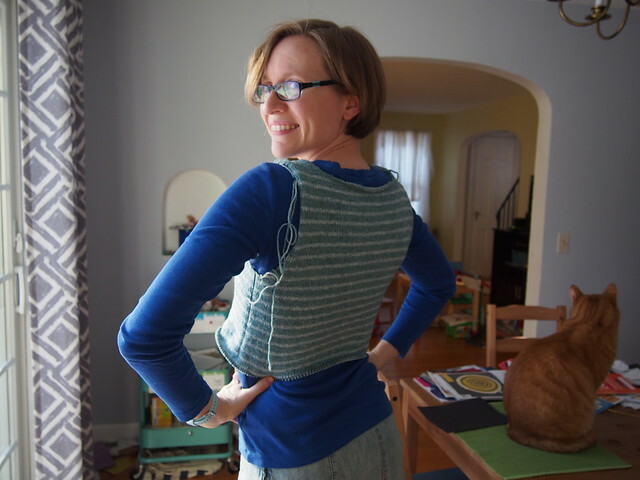 I only realized this after I had ripped almost all the way to the underarm, and then realized that the lifeline wasn’t there…because it was in the sleeve I was *supposed* to be ripping out. 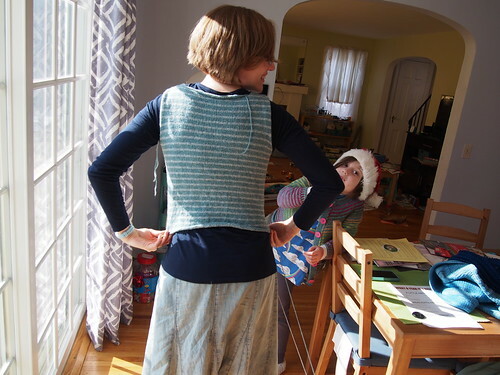 Mistake number two: Attempting to rip out a sleeve (or do anything else that requires attention) when your 7 year old is having a very high-need day? Not a good idea. Dear self: always, always triple check before starting to rip! I…was not happy. 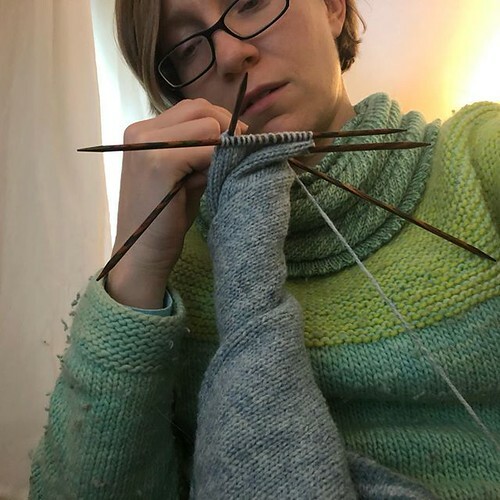 But, as I’m always reminding myself and others, the failure mode of knitting is just yarn, and I like yarn, and I like knitting. So, you know, it could be worse. But oh, do I feel like an idiot today! C’est la vie. 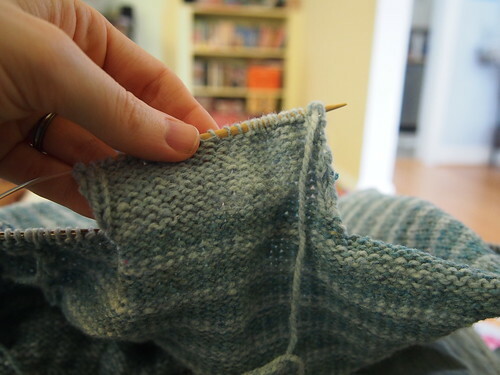 Here’s hoping the rest of the sleeve knitting is uneventful! 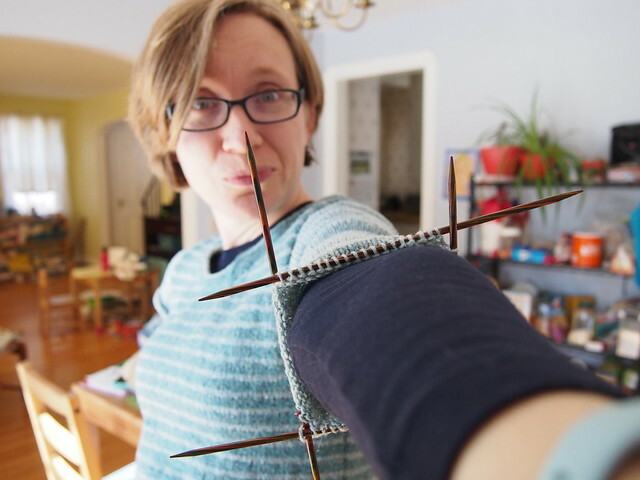 Look, I have a sleeve! …which should’ve been a clue to me that maybe, just maybe, I was dealing with more than just a run of the mill cold. Turns out, I had the flu. 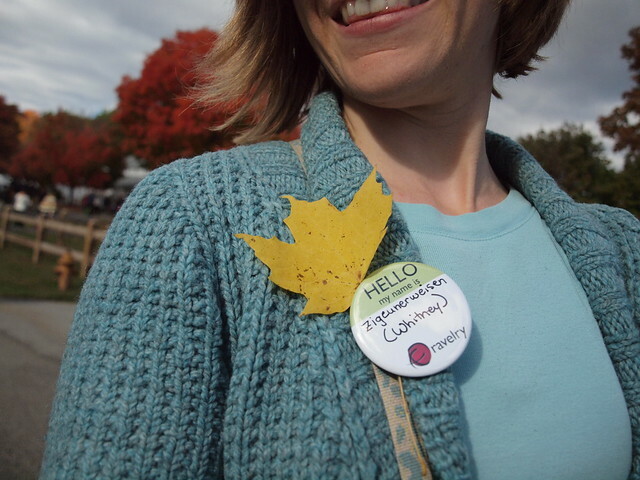 My flu shot did not save me. And y’all, it was BRUTAL. I had to cancel my Tuesday classes, and then ran my Wednesday and Thursday classes via Google Drive, and just sitting up at my computer to do that left me unable to do ANYTHING else the rest of the day. I’m still feeling a bit run down today, more than a week after I first started having symptoms. Ooof. 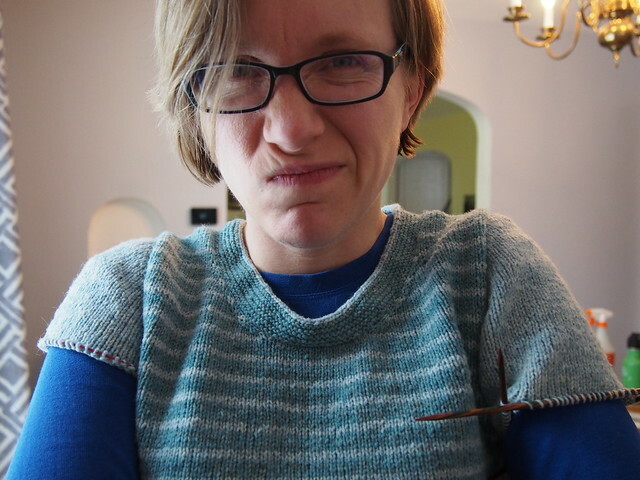 …that is still such a sick and miserable looking face I have on. Oh well! 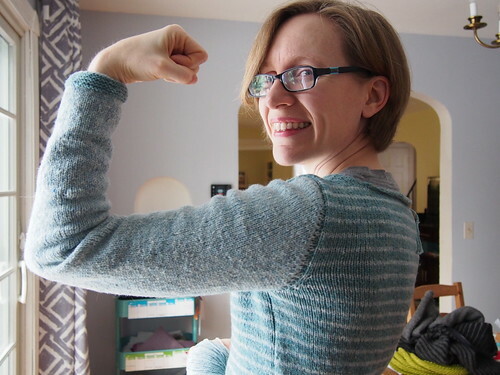 We didn’t do a great job of capturing the cuff of the first sleeve, but I ended up doing the same thing as I did on M’s original version of the sweater: I knit the cuff in garter stitch in the darker color, and then bound off in i-cord using the lighter color. 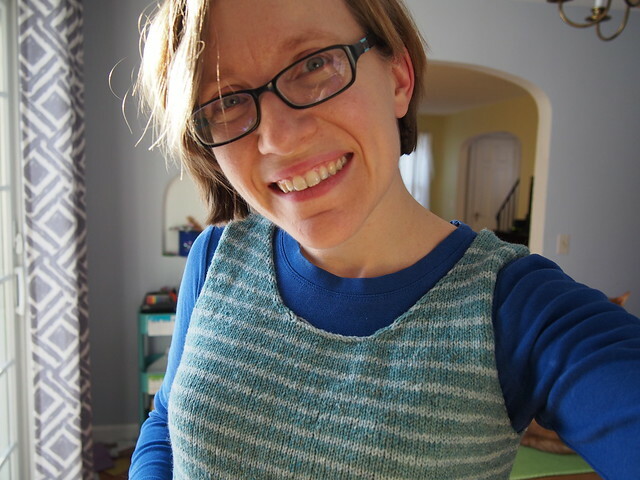 I’m excited to be getting so close to finished with this sweater! 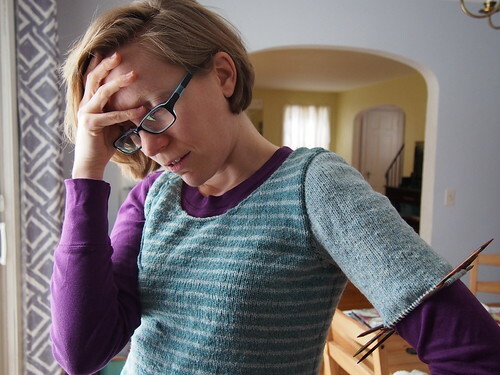 Once I do, I plan to return to M’s Octopus cardigan; I just haven’t had the time or mental energy to work on complicated colorwork recently, but now that my schedule has settled down a bit, and I’m (mostly) recovered from the flu, maybe I’ll be up for it soon. 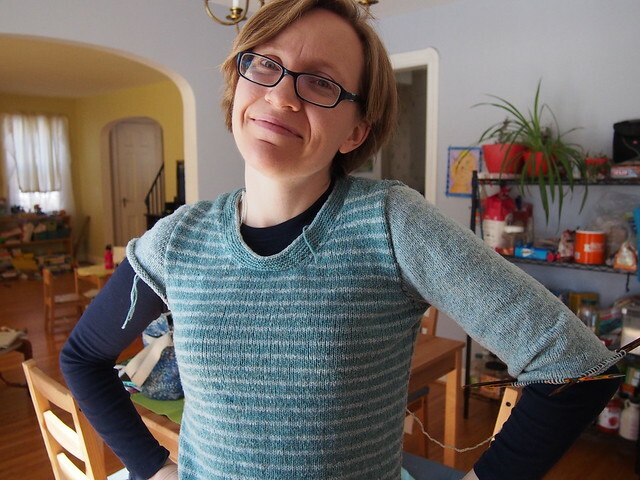 Yesterday, I went to an all-day silent meditation retreat (as part of training that I’m doing to become a mindfulness educator at my university) and while I didn’t knit at all during the retreat, I had about 45 minutes each way as the passenger in a car, so I was able to knit nearly all of the bottom hem of my stripey sweater! 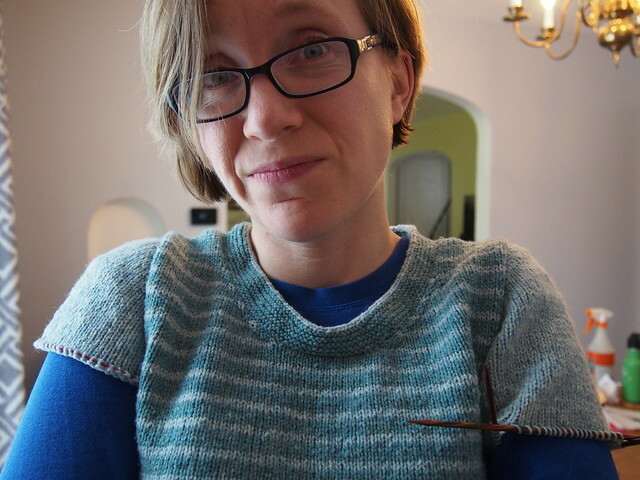 With a bit more time this afternoon working on the i-cord bindoff on the front hem, I now have the entire body of the sweater off the needles! It’s a little hard to see in this photo (the lighting was so much better this morning than this afternoon, alas! 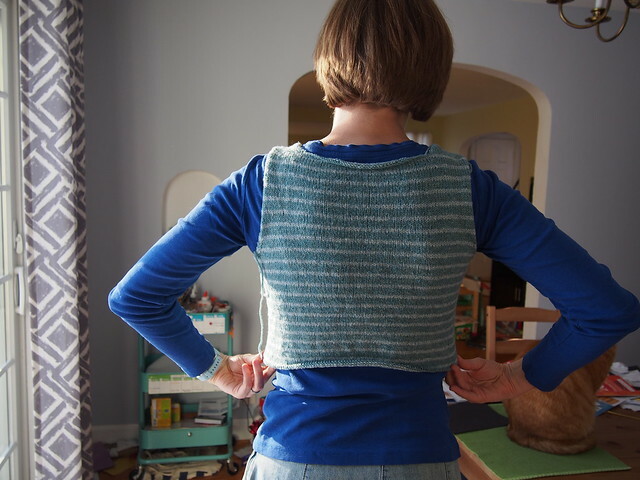 ), but the back hem is a bit longer than the front – I split them, and did an extra stripe repeat on the back before beginning the garter band. Then I bound off with an i-cord in the lighter color, kitchenering the ends of the i-cord together so that it’s one continuous cord. I’m pretty pleased with this! 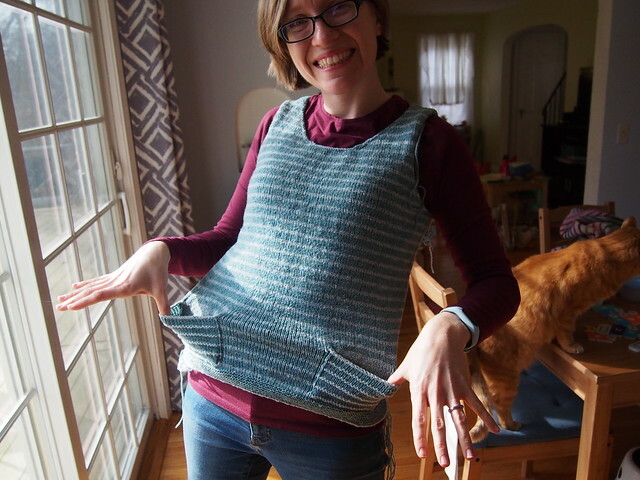 Now that the body is finished, the next step will be knitting the sleeves. 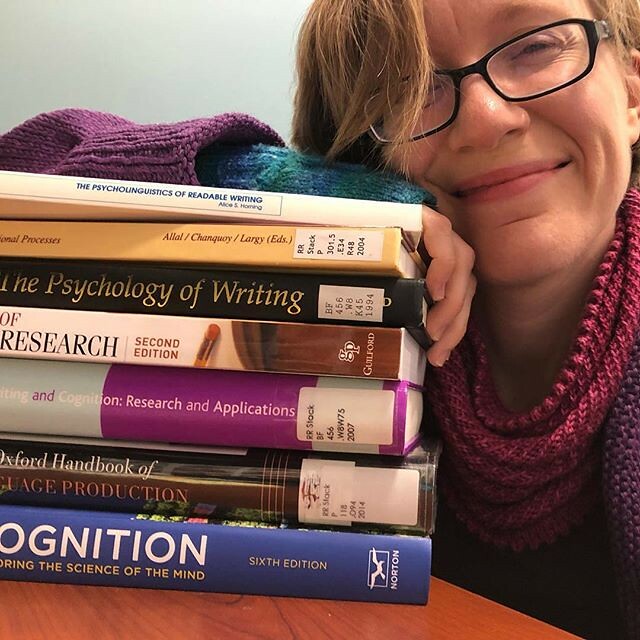 I’m not sure when I’ll get a chance to start that – the pick-up/short-row business is pretty attention-intensive, and I’ve got one more incredibly busy week ahead of me before my schedule shifts back to just “normal” levels of busy (which is still pretty busy). But maybe I’ll try to give it a go tonight. For now, I’ll just delight in my pockets! Now it’s time to grade some assignments and prep some classes for next week. 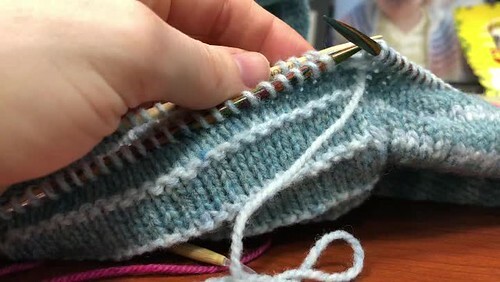 Much less fun than knitting sleeves! Things have been rather intensely busy here the past couple of weeks (we ended up having our furnace die during the polar vortex and were without heat for several days until we could get a new one, and I’ve had a huge extra workload with workshops, etc, along side that!). 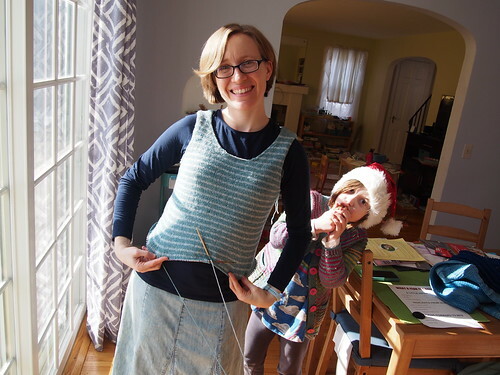 I’ve been making progress on my stripey sweater, though – a few rows here, a few rows there, sometimes knitting while my students work on in-class exercises and things. 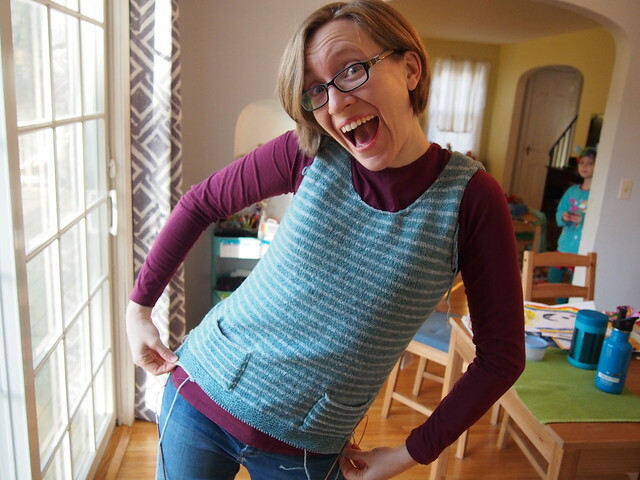 And I’ve actually, as of this morning, finished making the pockets on my sweater. So here are a few notes and details to catch us up! 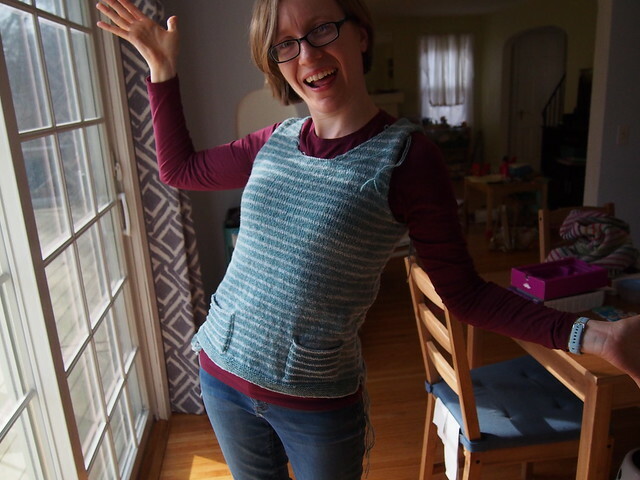 Last weekend, I tried on the sweater again, to see if I was where I wanted to be before starting the pockets. I decided that it was looking good, and just one more repeat of the stripe pattern would get me to where I wanted to be. 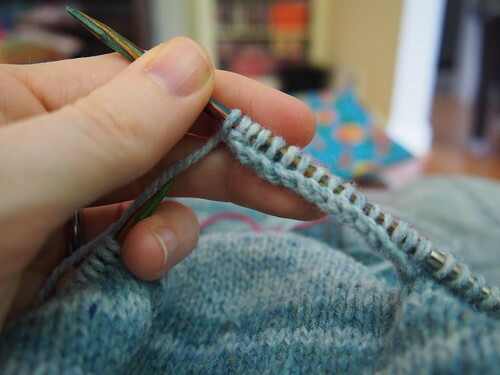 After I’d done that, I could simply knit around again, just like I’d been doing before, but each round, I joined the front to the pocket flap. 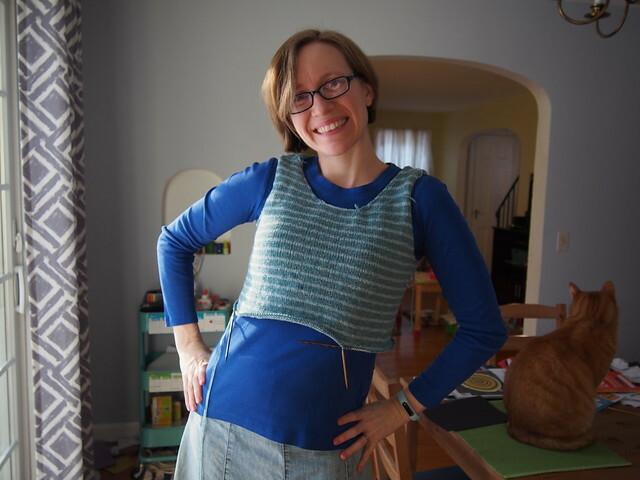 Now, my plan is to split the front and back, because I want a split-hem that is longer in back. 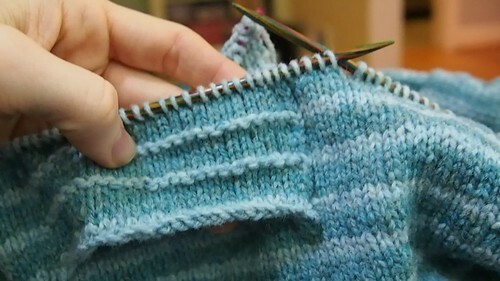 I’ll start the garter-stitch hem almost right away below the pocket on the front, but knit one more stripe repeat on the back before starting that hem. 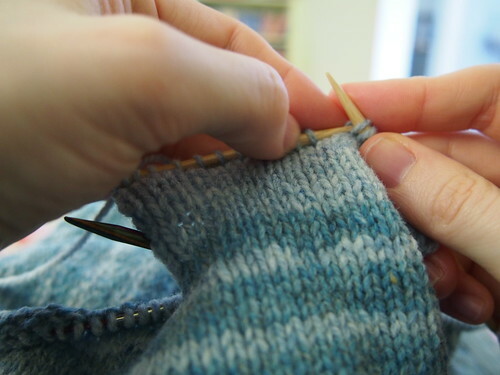 And then, it’ll be time to knit the sleeves! !